Nicodemus, Kansas, was founded in 1877 as a solely black community—regarded by some freed slaves as a paradise in the post-Civil War, reconstruction era. On the edge of the frontier, the town offered land that could be claimed through the Homestead Act, and a place untouched by racial hatred and discrimination. On paper, it was what black men and women in the South dreamed of; an opportunity to live freely and determine their own destiny. To own their own land, govern themselves, and reap the rewards of their own hard work, while coexisting peacefully among people who looked just like them. 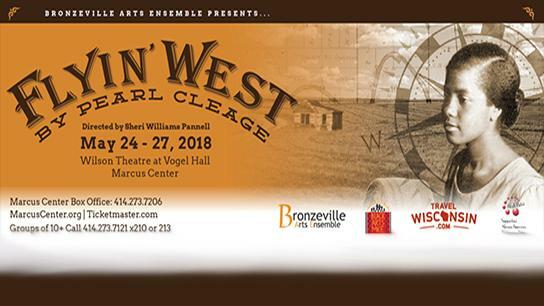 Pearl Cleage’s play “Flyin’ West,” currently onstage in Vogel Hall at the Marcus Center, examines the settlement of Nicodemus, Kansas, a chapter in 19th century history that isn’t often taught in school. She introduces us to a group of strong, black women who are thriving on the independence they’ve gained as successful farmers and leaders in the town. Miss Leah (a grounded Tosha Freeman) is the eldest — a former slave who has lost 15 sons and a husband due to illness and a cruel master. Sophie (the clear-eyed Malkia Stampley) is the pragmatic protagonist who sees nothing but possibility in their new home, after escaping the racially hostile city of Memphis. Fannie (a sweet Tasha McCoy) is ever the optimist and peacemaker of the group. And Minnie (the sad-eyed Samantha Montgomery) is the youngest; a fragile, former conservatory student with great promise, she married an abusive poet (J. T. Backes) who threatens all that the women have worked for. The historical basis for this story is tantalizing and rich, and according to the program notes, the author did a great deal of research in preparation for writing the script. Likewise, moments before the Bronzeville Arts Ensemble production began, director Sheri Williams Pannell spoke with love and admiration for the play and its writer, raising expectations once again for the story that would unfold. But sincere problems with the script, the direction, and the execution of “Flyin’ West” prevent the play from holding together, let alone taking flight. The first strike against the production is the pace. On the page, the play doesn’t drive towards an urgent climax—it sort-of meanders along. In fact, there’s no real problem to be solved until Minnie’s dastardly husband Frank enters (the virtual mustache-twirling Backes) several scenes in. To compound the problem, actors are slow to pick up their cues and make their entrances. There are also pauses programmed in to show the passage of time, which particularly in the second act, seem eternal. All told, the show clocks in at 2 hours, 40 minutes with an intermission and it feels much longer. The second problem with the show is its static direction. Too often characters have very long conversations sitting in one place. Most interaction occurs in the set’s kitchen and it’s a cramped space for six actors, but it’s not used well when there are fewer bodies onstage. With so little movement, the dialogue falls even flatter. Another issue is tone. The play begins as a realistic drama with interesting characters spending a great deal of time talking around a kitchen table. There is a budding romance, a friendly antagonism between two of the more stubborn members of the group, and lots of detail about their hardscrabble life in Kansas. But then Minnie and Frank arrive at the train station, visiting before they return to a much more urbane existence in London. At this point the tone veers so far into melodrama, it’s hard to believe Frank doesn’t start tying the other characters to the tracks then and there. Written to be despicable he is a drunk, a gambler, a violent wife beater, a money grubbing misogynist, a self-hating man of half white and half black lineage, a bully and wait for it — A BAD POET. And Pannell and Backes lean into that characterization until it's positively cartoony. It’s no wonder that (spoiler alert) the other characters line up in the second act for a chance to get rid of him once and for all. On opening night the audience was actually far ahead of the feminist pioneers, hurling advice to the characters onstage to kill the good-for-nothing and not look back. Stampley and Freeman both turn in solid performances, playing the characters who are the most interesting and realistic, in spite of a script that has them both spit out historical background information and instances of atrocities under slavery that don’t actually move the story forward. The rest of the ensemble has either thinner parts to invest in, or makes less investment in the lines they have. Anachronistic costumes, props and set pieces from mismatched eras only reinforce the haphazard approach to the play. In her director’s notes, Pannell writes that she hopes the play inspires audience members to do their own research into historic black communities. I echo that sentiment, and hope that research leads to better stories than this one. An edited version of this review appears at OnMilwaukee.com.